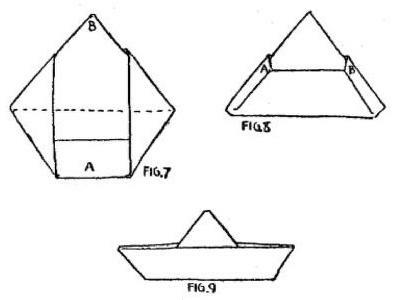 This page attempts to record what is known about the origin and history of the traditional origami design usually known simply as the Paper Boat (though, of course, there are also many other paper boats in origami). Please contact me if you know any of this information is incorrect or if you have any other information that should be added. Thank you. This design was known in both Western Europe and Japan at an early date. 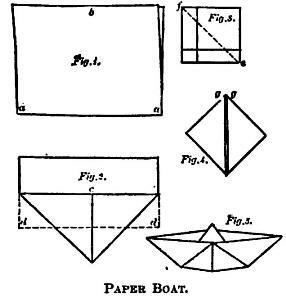 John Smith gives several references to Lewis Carroll folding 'fishing boats' out of paper to entertain children, the earliest of which is from 1890. However it is more likely that the design in question was the Chinese Junk rather than the traditional Paper Boat. 'Ranma Zushiki', a Japanese book of prints of decorations intended to enhance sliding room dividers, by Hayato Ohoka, published in 1734, contains a print that shows a group of folded paper objects, among which is the traditional Paper Boat. 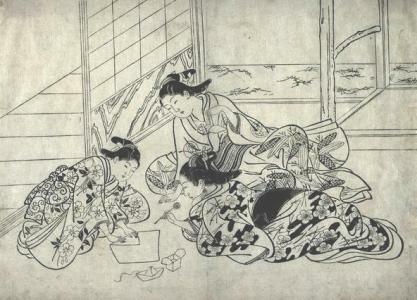 There are a number of prints, by, or after the style of, the Japanese designer Nishikawa Sukenobu (1671-1750), which show ladies folding Paper Boats along with a number of other designs. I have not been able to find a definitive catalogue of Nishikawa Sukenobu's works to confirm authorship or date. If they are all his work they cannot be later than 1750, when he died, but may be considerably earlier. The boats in these prints appear to be folded from squares rather than rectangles. The boats in the first two prints are different from the boats in the other three, which have two additional points visible behind their sail. This suggests that they were folded using different folding sequences. However, while it is simple to work out a folding sequence that produces one point in front of and the other behind the sail, I have not been able to find a folding sequence that leads to the configuration shown, where both additional points are side by side behind the sail. 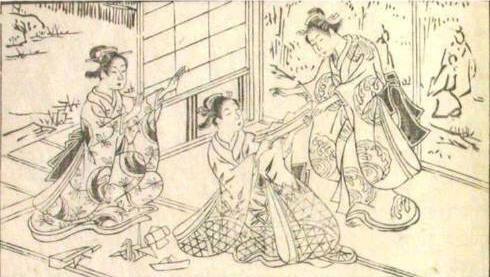 In this first first print the lady at the back is holding a Paper Boat in her left hand. This print probably dates to around 1720. The detail below is from 'The Doll Festival', from the book 'Ehon masu kagami, vol. I', which is in the possession of the Museum of Fine Arts in Boston, and is said to date from 1748. 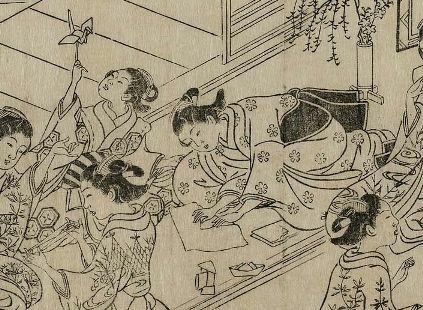 A Paper Boat also appears in this detail from a fourth print by Nishikawa Sukenobu, 'Ehon Hana no Kagami', which is also said to date from 1748. It shares many characteristics of composition with the print above. This fourth print is found in a number of blogs on the net but none of them give a date or the name of the artist. It does, however, look very similar in style to the other prints. 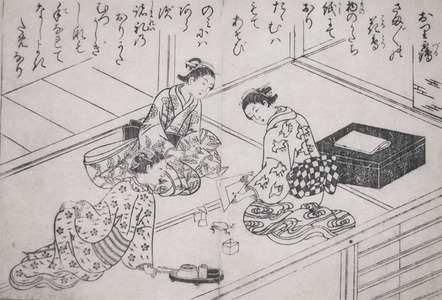 A paper boat is listed on page 24 of the Kan no mado (usually dated to 1845) as one of the designs omitted from the ms on the basis that they are already well known. A picture illustrating a solar eclipse which, quite oddly and incidentally, shows two traditional paper boats floating in a stylised sea, appears in a version of the book 'Tractatus de Spaera Mundi' written by John Holywood, an English mathematician and astronomer, who is also known as Johannes de Sacrobosco, which was published in Venice in 1490. According to his friend and biographer Thomas Jefferson Hogg, the romantic poet Percy Bysshe Shelley (1792 - 1822) had a passion for folding and sailing paper boats which he made from any paper available at hand including letters and the flyleaves of books. There is no direct evidence that these boats were traditional paper boats but it seems likely that this must have been the case. Several pages of Volume 1 of Hogg's 'The Life of Percy Bysshe Shelley' published in 1858, were devoted to describing this fascination, which seems to have almost amounted to an obsession. Hans Christian Anderson's children's fantasy story 'Den standhaftige soldat' (in English 'The Steadfast Tin Soldier') includes reference to a paper boat. It was first published on October 2, 1838, along with "The Wild Swans" and "The Daisy", as part of the anthology 'Fairy Tales Told to Children New Collection'. In the story two children make a boat out of newspaper, put the tin soldier in it and send it sailing away down the gutter. The paper boat eventually sinks when it fills with water. I have not been able to find whether the original illustrations showed this aspect of the story. The nature of how the boat is folded does not appear to be explained, which argues that Hans Christian Anderson probably believed it would already be familiar to his young readers. 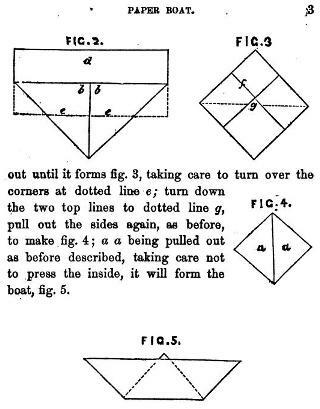 The earliest diagrams that I am aware of for the Paper Boat occur in The Boy's Own Toymaker' by Ebenezer Landells which was published in 1859 by Griffin and Farran in London and Shephard, Clark and Brown in Boston. Part two of 'The Kindergarten Guide' by Maria Kraus Boelte and John Kraus, which was probably first published by E. Steiger and Company in New York in 1882. This version of the Paper Boat seems to be made by an unnecessarily complicated method. 'Cassell's Complete Book of Sports and Pastimes', published in 1882, the paperfolding section of which was based on de Moulidars book. 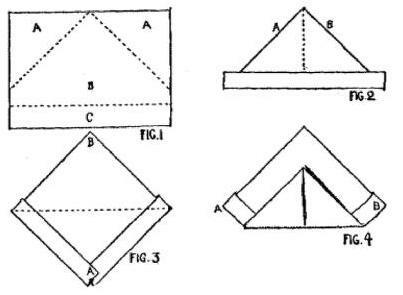 Eleonore Heerwart's 'Course in Paperfolding', which was first published in Dutch in 1895 then in English by Charles and Dible in London and Glasgow in 1896. 'Die Frobelschen Beschaftigungen: Das Falten' by Marie Muller-Wunderlich was published by Friedrich Brandstetter in Leipzig in 1900. 'Paper Magic' by Will Blyth, first published by C Arthur Pearson in London in 1920. 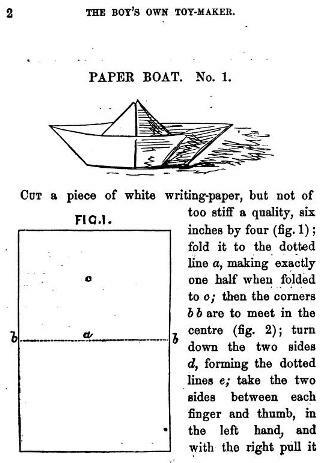 This Paper Boat is developed from a version of the Newspaper Hat in which the corners have been partly turned up to improve the shape. This method gives the boat a smaller hull and a larger sail. Margaret Campbell's Paper Toy Making, first published in 1936, as the Boat. Here the design begins from a rectangle and has a large sail. The traditional Paper Boat is the basis of the now well-known story of the Captain's Shirt where boat ends of the boat and the top of the sail are torn off the design at various stages in a story about a shipwreck and the remainder unfolded to show that the paper is now in the form of a rather tattered shirt. This story is often associated with Lillian Oppenheimer (1898 - 1992) but I do not know whether she invented it, and if she did, when that invention took place.